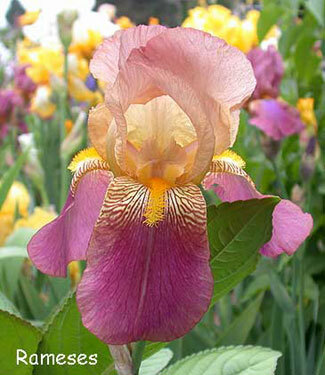 This color class was based upon an early hybrid that was thought to be a species, Iris squalens L. . The Latin squalidus means dirty, neglected, squalid. The original I. squalens was muted in tones with prominent veining and haft marks. the falls were somewhat darker brownish purple and the standards a muted light yellow with purplish stains/veins at the edges. The 1939 color classification refers to blends as either Shot or Squalens. It states "Black, brown or yellow blended with blue or red makes a Blend, as --S9L, or a light pink and yellow blended bicolor as 'Rameses'." 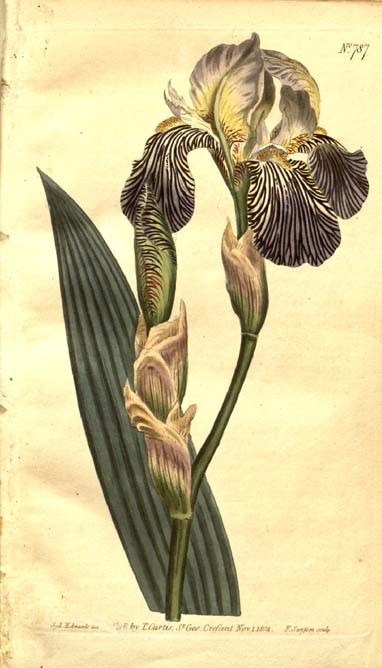 Iris squalens L.